Well, not quite double denim - though I'm definitely not opposed to it - but I made a second skirt from the MASSIVE amount of denim that I accidentally purchased. Unfortunately I've used it all up now, so I won't be recruiting members for a B*Witched tribute act. 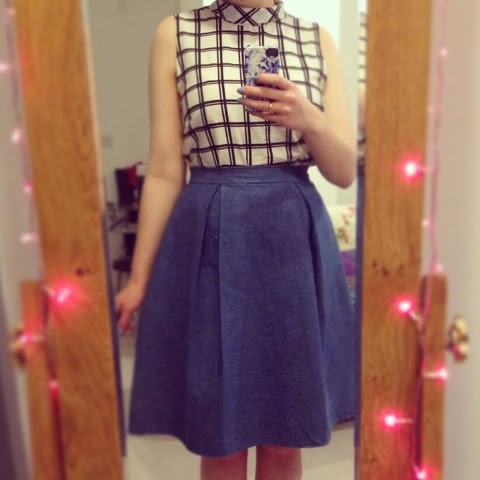 I decided to make a second version of the box pleat skirt from the Sewing Bee book. And I did something that I know I shouldn't have done really... I cut against the grain. Rather than matching the selvedges when folding like you're usually meant to, I had to fold the fabric the other way to make the pattern fit. In fact, there was enough to lengthen the skirt a bit, and in my defence, it was more economical - waste not want not etc. 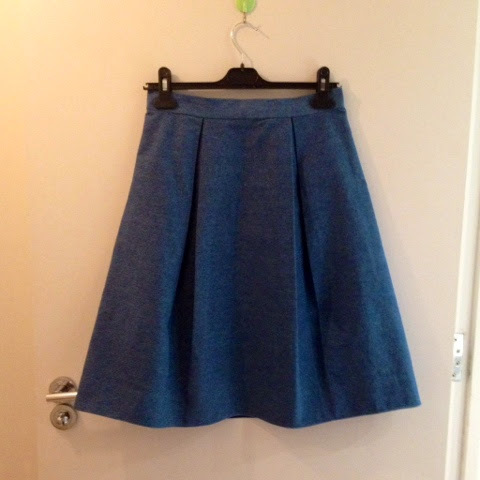 NOTE: I wouldn't normally do this, but as it as I already have a skirt made from the same denim, (which you can find here) I thought why not? If it goes wrong it goes wrong, and then I'll have learnt my lesson. 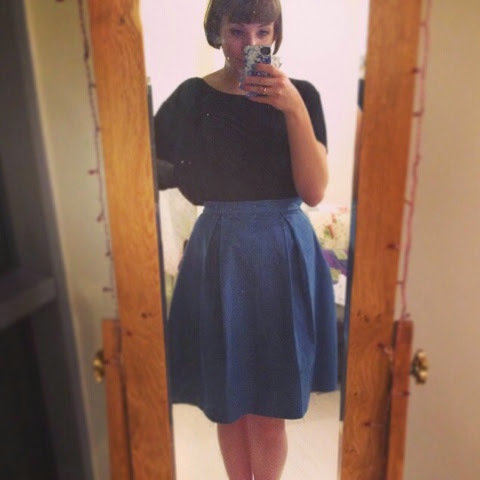 I added 3" to the length - I'm going for the demure look clearly - and after causing my sewing machine some serious stress with a few too many layers of denim, I had a finished skirt, pretty much all in an evening's work! I just had to slipstitch the inside of the waistband rather than machine sew due to the thickness of the denim. The pattern didn't have a lengthen/shorten line, which probably suggests that I wasn't supposed to go altering it, but oh well, I gave it a go anyway! I actually quite like the length, I think it makes the skirt look completely different to my first version. 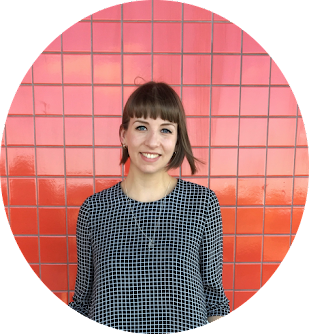 The waistband however, is much sturdier and less likely to crease and bunch up when sitting. I'd definitely recommend using a thicker interfacing (or a couple of layers of lightweight) if making the skirt with a thinner fabric. The box pleats hold well, but I wasn't really sure where they should stop. In the poly cotton, they fell much more naturally, so in a fairly robust denim, it was quite difficult to make them look like they naturally fade out. It's not my biggest success, but then it's not a disaster either. It might not be holiday wear, but that's because it's quite heavy and I'm only taking hand luggage (ha! ), but I imagine it will get a bit of wear over the summer.